Trent Bridge Cricket Ground was founded in 1841 by William Clarke. It is the 3rd oldest major cricket ground, preceeded only by Lords and Eden Gardens in Calcutta. The first international match held here in 1899 ended in a draw between England and Australia. Following is a brief history of Trent Bridge Cricket Ground by Peter Wynne-Thomas (secretary of the Association of Cricket Statisticians and Historians and Honorary Librarian at Trent Bridge. ):- 'Cricket in Nottingham had formerly been played on the grassed, levelled area inside the town's oval race-course, on a large acreage of land called 'The Forest' about one mile north of the town. The first bona fide inter-county Nottinghamshire game was staged, against Sussex, on The Forest in 1835. The cricketers were unable to charge admission to watch this, and other major games, because The Forest was owned by the Town Council. In December 1837, the captain and self-appointed manager of the Nottinghamshire team, William Clarke, married the landlady of the inn situated to the south of the bridge over the Trent, and generally known as the Trent Bridge Inn. The following spring he laid a cricket ground in the meadow attached to the inn. The meadow was bordered on one side by the road to Radcliffe on Trent and Grantham and on the adjacent side by the lane to West Bridgford church. The other two sides were bounded by hedges separating the meadow from the land belonging to West Bridgford Hall, which could be seen across the fields. Clarke erected a close-boarded fence round his ground and using the inn as accommodation for the cricketers, arranged that all major matches involving Nottinghamshire should use his ground, rather than The Forest. 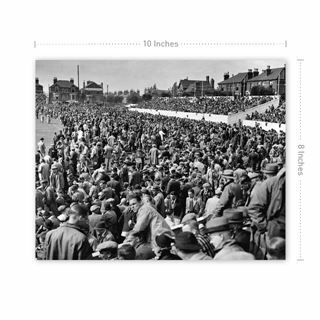 He found however that the number of games which drew crowds to his Trent Bridge Ground was very limited. He tried a variety of non-cricketing spectacles with luke-warm results and in 1845 left the Inn, which he gave over to his step-son, John Chapman, and went to London. Here he formed the subsequently famous All England Eleven and at last made a substantial living from organising matches all over Britain for his All England Eleven. Step-son, John Chapman, carried on with the business of the Inn and cricket ground, but had little more success than Clarke. He moved away and another inn-keeper took on the lease. It was not until 1859 that very much happened at the cricket ground - the occasional county game and rent from two or three local cricket clubs, plus sundry non-cricketing events. In 1859 however a local solicitor, John Johnson, took it upon himself to inject some sense and order into the haphazard Nottinghamshire County Cricket Club. He induced the subscribers to elect a proper committee, he arranged a few inter-county games and he had built, at the back of the Inn, a single storey brick pavilion. In 1861 he introduced the idea of an Easter Colts trial, in which 22 young players were invited to play a two-day game against the Notts 1st XI and prizes were given for the best batting and bowling by a colt. It had been clear from William Clarke's days in the 1830s that the county of Nottingham possessed some of the most talented cricketers in England. Johnson was keen to harness this ability. He was fortunate that he had, in Clarke's successor, George Parr, the best batsman in England, and in John Jackson the most feared of fast bowlers. 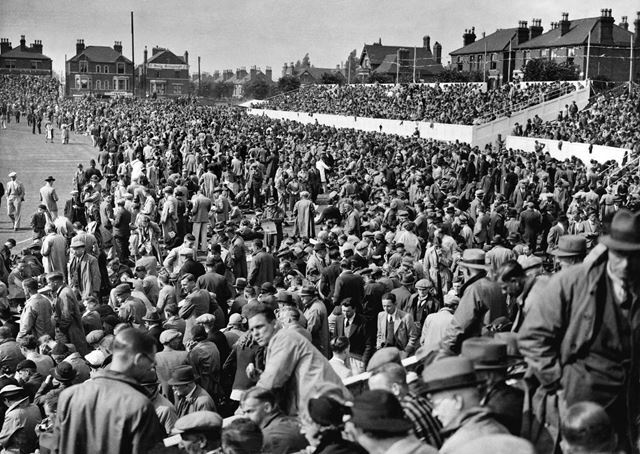 Within a few years the county had wrested the title of 'Champion' county from Surrey and substantial profits were being made from the crowds who came to watch the Trent Bridge matches. In 1872 the county club were in a position to erect a much more elaborate pavilion on the opposite side of the ground from the Inn. The successes continued, so much so that within ten years the new pavilion was found to be totally inadequate. The County Committee took the lease of a further two acres at the rear of the pavilion and built in 1886 the then largest pavilion in England - within ten years, Lord's, Old Trafford and The Oval had more than matched this however! The area of grass was large enough to allow the eastern side to be used by Notts County F.C. as their home ground and they built some stands on three sides of their football pitch in the 1890s. The cricket club relied mainly on benches and tents, plus the new pavilion which had about 2,000 seats. All this changed when the Committee was granted the First Test match of the 1899 season, against Australia. A covered semi-circle of stands, with a new reporters' box were built in 1898 and the following winter. 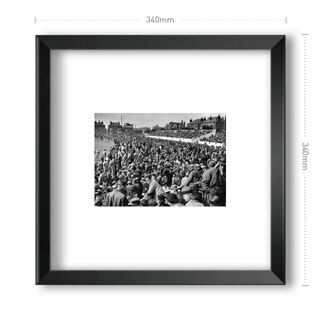 The wickets were pitched for this historic match in such a way that the football stands could also be employed and thus the whole ground was ringed with spectators' accommodation. A commodious ladies' pavilion was also erected. In 1910 it was felt that the cricket and football seasons were too overlapping to allow the football club to continue to rent a section of the ground and Notts County moved to Meadow Lane, the ground which they still occupy. Directly after the First World War, an opportunity arose for the Cricket Club to purchase the freehold of the ground and the Inn - the Musters family of Colwick Hall owned the freehold of much of West Bridgford including the ground. The club bought the freehold, then managed to sell the inn to a brewery for the same money as the freehold of both inn and ground had cost the club. The brewery were however given the ground catering rights in perpetuity. Possessing the freehold, the County Club could now develop the ground. It was a fortunate coincidence that the keenest supporter of the club and a committee member was the self-made millionaire, Julien Cahn. Through his generosity the club built five large concrete stands, two (West Wing and Radcliffe Road) being double storey. He also financed a new indoor net at the rear of the pavilion. With the use of circles of benches on the grass round the boundary and all the new stands, there was accommodation for about 30,000 spectators. 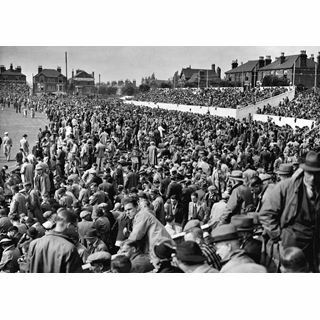 One estimate gave the record crowd as 35,000, but as club members in those days were never counted when they entered the ground no precise figures are obtainable. During the Second World War, the Army occupied the pavilion using it as the central mail sorting office. Matches were still played on the ground, the reporters' accommodation being turned into a dressing room. In the First World War the pavilion had been used as a military hospital. The only bomb damage inflicted on Trent Bridge in the 1939-45 conflict was a direct hit on a single storey building adjoining the indoor nets, used by the local Boys Brigade. Apart from basic renovation and repair, the ground saw no post-war improvements until 1956, when the Parr stand was built on the West side. The stand was directly in front of an ancient elm, named Parr's Tree (George Parr was reputed to have regularly hit the ball into this tree during his long career with Notts). The late 1960s saw Nottinghamshire, along with most other county clubs struggling to make ends meet. The Committee decided that drastic measures were required and gained planning permission for a multi-storey office block in the north-east corner of the ground and a squash club in the south-east corner, adjacent to the main gates. Both these projects were completed in the early 1970s. The building of the office block meant the demolition of the Australian-style scoreboard (erected in 1950) which occupied part of the office block site. A new semi-automatic board was built between the block and the playing area. In 1979 the pavilion was renovated and a library formed out of part of the Long Room bar area; new reporters' quarters were built, the old building being converted into executive boxes. The building of the office block with its necessary car parking had meant the demolition of some of the concrete stands built in the inter-war period and, with the banning of the use of loose benches and spectators sitting on the grass, the maximum crowd accommodation dropped dramatically - the present figure being about 13,000. In the 1980s two new stands were erected - the William Clarke stand at the back of the inn, which also housed larger press facilities, and the Larwood and Voce stand with a public house at the rear, near the indoor nets in the south-east corner. In the 1990s the old Ladies' pavilion, which since the 1970s had been converted mainly into a restaurant, was demolished and a large three storey stand built, the middle storey being a banqueting suite for 200 diners. Currently planning permission has been granted for a three storey building to replace the Radcliffe Road stand and its adjacent accommodation. This scheme includes indoor nets, some overnight accommodation for young players and an increase in seating capacity of about 2,000. The ground is considered by players and spectators to be one of the most pleasant in England, the architecture having been kept within the parameters set by the 1886 pavilion.